The Jasper City Council does hereby announce that it is considering changes to the garbage service. This could affect city customers in that rates may increase, back door pick-up may no longer be available (or would be an additional cost to the customer), as well as daily garbage pick-up may no longer be offered. 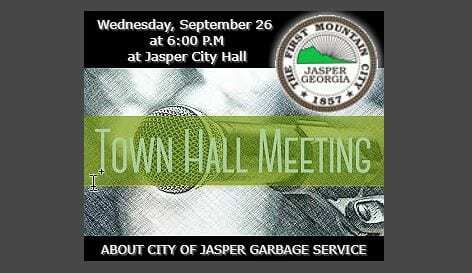 A TOWN HALL MEETING is being held on Wednesday, September 26, at 6:00 P.M. at Jasper City Hall in order to hear citizen’s concerns and comments. All citizens are invited to attend.